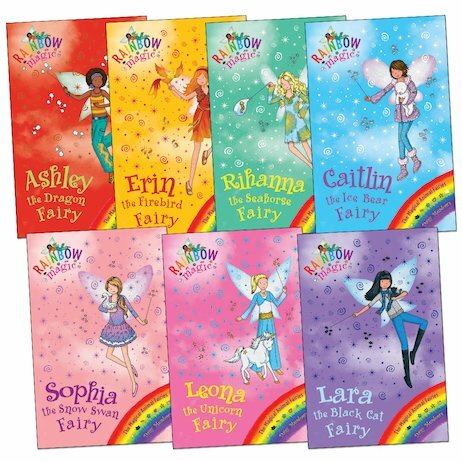 In Fairyland, Rachel and Kirsty have met fairies and goblins. Now they’re making friends with dragons, unicorns, ice bears and firebirds too! The Magical Animal Fairies look after seven young enchanted creatures. They train them to use their powers wisely, for the good of Fairyland and humankind. But now the creatures have been stolen by Jack Frost, who wants to bring them under his evil influence! What can Rachel and Kirsty do? i love all these books and i especially love the princes faires ! It was magical and awesome. I love the way the writer has made these books flow nicely. I’ll LOVE Lara the Black Cat Fairy! I have read all of them they are Really Good!